Are Pac-Man Bumper Cars coming to Super Nintendo World?? There have been tonnes of rumours that Super Nintendo World may not be coming to Universal Studios but instead maybe to one of the new Universal parks yet to be built.. This would also mean loads more room for rides and attractions! 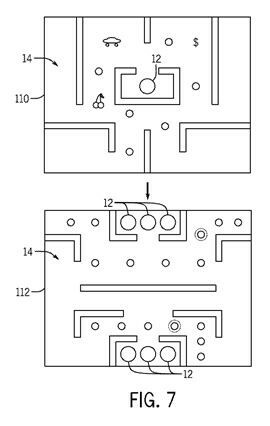 Now we’ve already spoken about the rumours surrounding Donkey Kong and Mario Kart attractions and maybe even a Yoshi attraction as well as kids areas however some more speculation has been happening regarding the possibility of a Kirby themed attraction or a Pokemon dark ride but best of all it looks as though there might be a Pac-Man attraction making an appearance! The above image and below video are for Nintendo World set to open in Japan in 2020 with the Orlando one opening shortly after. 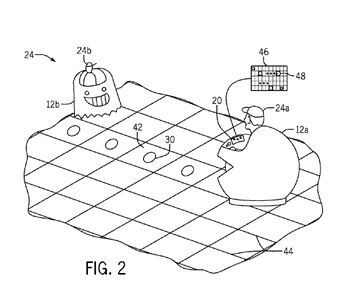 In 2014 Universal filed a patent which was granted approval this year which shows a Pac-Man style ride vehicle which looks as though it will be used in a bumper car style attraction. It looks as though the floor would be self-illuminated and riders would be able to ride over images that will cause them to score points which can be tracked through a display module in the car. Once a rider drives over an image it will either disappear or change colour.. It also looks as though the ride vehicles will navigate through specific pathways that can actually change during a ride sequence depending on what images you ride over. This could cause you to freeze or be slowed down for some time. It also seems like riders will be able to affect other riders experience too by blocking other cars to gain more points. Now this may be sounding like quite a rough ride but Universal have explained that the ride vehicles may be programmed to not actually contact other cars or slow them down before impact and its sounds like all cars will be equipped with a steering wheel, brake and gas, pedals, a joystick, a display screen, one or more buttons etc. Call me a nerd but the floor sounds like one of the most interesting things about this attraction. Looking at the patent it could be either an LCD or LED display surface which is actually a very techy move by Universal. If you’re a nerd too you might remember that Disney had an idea about using this type of technology for Pandora to have interactive sidewalks that would react to footsteps – there must be a reason this wasn’t bought to life.. it could be that it was because it is set outside whereas it looks as though this Pac-Man style attraction for Universal will be inside.. hmmm..
For us brits, Bumper Cars are a key part of any fair and you can even find them inside most UK themeparks however this would be the first attraction of its kind in any major Orlando Theme park however as we always say.. most patents never actually come to life so we cannot guarantee this is going to be a thing however Nintendo World and Pac-Man fit together very well so it would be an awesome addition! What do you guys think? !